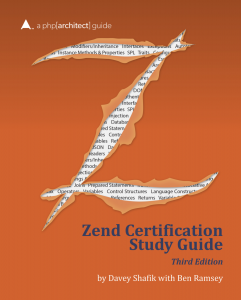 After many months of work, a couple of weeks ago php[architect] published the 3rd edition of the Zend Certification Study Guide. I am really proud of this edition, which has been updated completely up to PHP 5.6 (the certification is currently up to 5.5), making it a great desk reference for everything new in PHP. It includes 3 new chapters, and 2 new appendices, including one on the new debugger added in PHP 5.6, phpdbg — that’s over 80 pages of new content. All of the new additions indicate which version they were added in, and based on a comprehensive scouring of the NEWS file, I am confident that anything worth mentioning as new in PHP has been included. 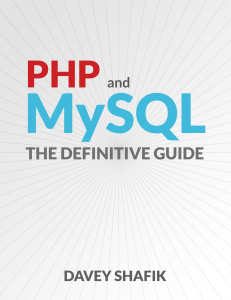 Additionally, I just announced a new project of mine, PHP and MySQL: The Definitive Guide. This is intended to be a comprehensive, in-depth book on vanilla PHP and MySQL. It will cover everything from SQL basics, to MySQL Native Driver, making it ideal for all skill levels, and hopefully turning even the most novice user into an accomplished developer. This book will be published via Leanpub, and I will start making it available as soon as I have some of the beginning chapters completed — currently it’s about 30-35% complete, but the majority of it is intended to end up towards the end of the book. If you are interested in this book, please show your support by filling out the form — this is crucial for me to gauge interest and pricing. The book should definitely cover everything you would need in enough detail for the exam (it is, after all, the purpose of the book).